Interest in electric vehicles (EVs) and hybrid electric vehicles (HEVs) is growing steadily as battery technologies improve and the driving range of such vehicles increases. Perhaps as important, EVs/HEVs offer a “green” alternative to traditional vehicles powered by internal-combustion gasoline engines. EVs and HEVs rely on robust electric motor drives, large-capacity battery pack, power inverters, and efficient distribution of power from charging source to battery and then throughout the vehicle. Busbars, which comprise a system of electrical conductors for collecting and distributing current, provide the means to efficiently distribute power to the vehicles’ various subsystems. A number of different types of busbars are commercially available, so specifying the best match for an EV/HEV application is a matter of understanding the various requirements of an EV/HEV and how different types of power busbars can meet those requirements. Efficient use of a limited amount of energy is critical to any vehicle design and EVs and HEVs typically work with rechargeable lithium-ion battery backs as their source of energy. Fortunately, the cost of these battery packs has been dropping in recent years, to around a current cost of about $300 USD/kWh. The cost of EV/HEV battery power is expected to continue to drop during the next decade, making EVs and HEVs more affordable and priced more in line with vehicles based on internal-combustion engines. Acceptance of EVs/HEVs is growing to a point where more than 200,000 Nissan Leafs have been sold worldwide. In fact, in some countries, such as Japan, electric vehicle charging stations now outnumber gas stations. Many EVs are now referred to as “plug-in” EVs for their recharging capabilities and are equipped with “fast-charge” charging modes to provide quick energy for shorter driving distances. Power storage and driving range have been chief concerns with EVs/HEVs, with power typically provided by large banks of battery cells combined in sealed packs to achieve the required operating voltage and current to power a vehicle’s electric motor. Of course, induction motors, whether dedicated to each wheel in some novel designs or with power transferred to the front wheel axle through a transmission system, are not the only subsystem in an EV/HEV requiring electric power. All of the basic vehicular functions found in a vehicle powered by an internal combustion engine, including heating, cooling, lights, and warning systems, require electric power in an EV/HEV, and each subsystem when in use can subtract from the total driving range possible with a charged vehicle battery pack. Fortunately, effective power distribution within an EV/HEV can contribute to improved driving range. A number of battery technologies are employed in new EVs and HEVs, with lithium-ion (Li-ion) technology providing the most popular solution for the large battery packs that operate the electric drive motor. Traditional lead-acid batteries are still commonly used within EVs and HEVs as auxiliary power sources, for functions such as sensors, cooling fans and lights. Li-ion battery systems can provide 130 Wh/kg energy capacity and handle thousands of charging cycles with minimum degradation of storage capacity. For a typical EV or HEV with a driving range of 100 miles or more, this translates into a useful Li-ion battery lifetime of 6 years or more (or the typical warranty period for a new EV/HEV). Several manufacturers are developing variants of lithium-based power cells, including lithium-iron-phosphate batteries and lithium-titanate batteries, attempting to add range to EVs and HEVs, although cost must be within certain limits for competitive automotive markets. Additional vehicular battery technologies include nickel-metal-hydride (NiMH) cells, which are heavier and less efficient than Li-ion batteries, but considerably less in cost, and zinc-air batteries, but Li-ion batteries currently represent the dominant technology in EVs and HEVs. Cells in a high-power EV/HEV battery pack can be combined in series or parallel to achieve voltage ratings approaching 400 V. Individual cells of about 1.5 to 2.0 V are typically combined using busbars rather than insulated cables. A busbar is essentially an electric conductor and ground plane separated by an insulator. It can be fabricated as a single layer component or with multiple layers, including circuit paths for signals as well as for distributing power. As with other basic circuit components, a busbar can be characterized by its resistance, capacitance and inductance, ideally with its electrical contributions distributed as evenly as possible across its length to avoid performance inconsistencies. While the lowest possible resistance and inductance values are to be preferred in a busbar for EV and HEV power distribution, some busbars for that purpose have capacitance added in different ways to increase the charge-carrying capabilities of the power-distribution structure. Because even low resistance will cause heating effects from large current flow at high enough power levels, it is important to minimize the contact resistance at all connection points along a busbar, including solder joints. To minimize contact resistance, groups of battery cells are often laser welded to a busbar in the process of assembling the large, high-power battery packs for EVs/HEVs. Laser welded connections can also be made as part of an automated assembly process to minimize manufacturing costs in large-volume production. With the proper materials, a busbar can assist thermal management along with power distribution in an EV/HEV. A busbar’s conductor material and the cross-sectional size of the busbar will determine its current-carrying capacity. Laminated busbars typically consist of copper or aluminum conductors, which may or may not be plated with an additional conductive metal, such as silver or gold. Busbars can be fabricated in a variety of shapes, including flat strips, solid rods and hollow tubes, with flat or hollow forms generally preferred for high-current applications. Although the AC drive motors used in EVs/HEVs generate very little heat compared to their internal combustion counterparts, the flow of current across any resistive junction in a vehicular power-distribution system can generate heat, including within the battery pack itself. Typically, good electrical conductors such as copper are also good thermal conductors. In a busbar, it is the blend of materials and differences in coefficients of thermal expansion (CTEs) for a busbar’s composite materials that can pose challenges due to ohmic heating and at elevated environmental temperatures. Busbars designed for low electrical and thermal resistance can readily serve as part of an EV’s/HEV’s thermal path, from a heat source to a heat sink or coolant reservoir. Busbar materials can also limit process manufacturing temperatures for interconnection methods, such as when using lead-free-solder attachment methods, and expected reliability, particularly if busbar material temperatures are not rated above the temperature limits of a lead-free or reflow solder process. Figure 1. Laminated busbars in EVs/HEVs are essentially for transferring electrical energy from the large high-power battery pack to the inverter for conversion to AC electricity for use by the electric engine. Along with combining the power cells within an EV/HEV battery pack, laminated busbars offer practical alternatives to multiple-conductor cables for distributing power to the many sensors, subsystems and other electronic components throughout an EV/HEV. Primary among these different electronic components is the AC drive motor and inverter system that provides drive power typically to the front axle in an EV/HEV (Figure 1). The inverter converts DC from the battery pack to the multiple-phase AC power needed by a three-phase induction or permanent-magnet motor. Power conversion in an EV/HEV usually takes place in several stages, often employing IGBT devices for power conversion. The voltage from the vehicle battery pack is first increased by a DC/DC boost converter to the minimum voltage required by the inverter. This can be a significant increase in DC voltage, from 200 V or less to 600 V or more. Once the voltage is boosted, it is converted to an AC voltage at the proper frequency by means of the inverter to drive the vehicle’s electric motor. Busbars and different connectors provide practical methods for distributing energy initially from the high-power battery pack to these different power-generating components and on to other components within an EV/HEV electrical system. Busbars can also serve as a key part of charging process so essential to EVs and HEVs, as a portion of the low-inductance power transmission path that delivers energy from a home or charging station to the Li-ion cells of a vehicle power pack. Mechanically, busbars for EVs/HEVs must be durable, capable of withstanding high levels of vibration, and operate over wide ambient temperature extremes. Electrically, they must provide low-inductance conduction of electrical energy with high isolation from other circuits and potential ground points to avoid arcing. The energy requirements of an EV/HEV can vary widely, with the largest amounts of electrical energy required by the inverter and electric drive motor. An EV motor has a wide range of power levels, from lower-voltage operation at slow speeds to higher-power use when accelerating or climbing steep grades. Low-inductance busbars can help achieve low-loss transfer of energy with high energy efficiency from a battery pack, by minimizing energy losses in the power transmission path from an EV’s high-power battery pack to the inverter and electric drive motor. In contrast to power cables, busbars also make it possible to achieve power distribution with high power density, by mounting active components for power conversion, such as IGBT semiconductors and passive circuit elements, such as capacitors and EMI filters for noise reduction, on the busbars. In most cases, circuit elements can be incorporated onto a laminated busbar prior to its installation in an EV or HEV, or as part of the busbar’s manufacturing process. Incorporating electrolytic capacitors into busbars for motor drives can improve performance while also conserving circuit volume. For further savings of space within an EV/HEV, hybrid forms of busbars are available with signal paths alongside the power planes for interconnecting, for example, current or temperature sensors and control units to on-board vehicle computers and driver controls. Figure 2. 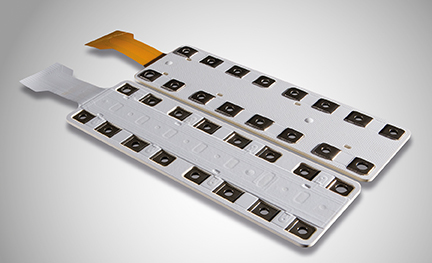 The ROLINX Hybrid is an example of a commercial laminated busbar that combines signal and power connections to save space in the design of an EV or HEV. Understanding the performance limits of a laminated busbar can help guide optimum use of these components for power distribution in EVs and HEVs. As an example, the ROLINX Hybrid from Rogers Corp., Power Electronics Solutions is a laminated busbar that combines power and signal paths in a compact assembly (Figure 2) suitable for power distribution and signal connections within and from the large rechargeable battery pack in an EV/HEV. In addition to power-handling capabilities that equal or surpass those of shielded cables, the low-inductance busbar provides signal and ground planes for mounting and connection of additional components, including electrolytic capacitors and surface-mount-technology (SMT) components, such as EMI/RFI filters for noise reduction within a vehicle’s power distribution system. As noted earlier, busbar performance will depend upon the composite materials used to construct the busbar. The ROLINX Hybrid employs either copper or aluminum conductors in various thicknesses: standard thicknesses from 0.5 to 6.0 mm for copper and from 1.0 to 5.0 mm for aluminum. For any EV/HEV application where heat is a concern, copper offers superior thermal characteristics to aluminum, with thermal conductivity of 401 W/mK for copper compared to 237 W/mK for aluminum, and thermal expansion of 16.5 ppm/K for copper compared to 23.1 ppm/K for aluminum. Aluminum busbars are attractive for EV/HEV applications because they provide reliable electrical performance while helping to save total system weight, since aluminum busbars are typically 50 percent lighter than copper busbars. For equivalent electrical/thermal performance, however, the cross section of an aluminum busbar will be greater than that of a copper busbar with, for example, a 1 mm copper conductor replacing a 2 mm aluminum conductor. For EV/HEV applications, copper busbars offer excellent solutions where space is tight, while aluminum busbars, enable efficient energy distribution with weight savings compared to copper. Aluminum is also less costly than copper. In the design of the conductors for any busbar, the ground return conductor should be at least as large in area as the voltage conductor. This serves to improve the capacitance of the busbar and also provides a sufficiently large ground plane for thermal dissipation and to minimize voltage variations due to temperature effects. An adequate busbar ground plane can also help to limit coupling effects from nearby electronic circuits and components in an EV/ HEV. Insulation/dielectric materials used in the construction of busbars for EVs and HEVs are as important as its conductor materials. Insulation should exhibit stable dielectric constant with temperature so that the resulting capacitance and voltage through a busbar remains stable with temperature. Higher busbar capacitance translates into lower impedance and better rejection of noise, and can be achieved by using thinner dielectric layers between a busbar’s conductive layers. Figure 3. The edges of a busbar may or may not be sealed with insulating material depending upon the requirements of an application. Insulation is used on both the outside and inside of a sealed busbar construction, with a variety of insulation materials applied, including flexible polyester films (for higher-voltage, lower temperature applications) and polyimide films (for higher-temperature, lower-voltage applications). Inner insulation often includes some form of filler for increased insulation and rigidity, such as glass fiber or cloth (Figure 3). When required, busbars can be sealed by means of edge insulation, typically by means of mold or potting. Specifying a laminated busbar for an EV/HEV or other application requires an understanding of certain minimum dimensions, including the form factor for a particular EV or HEV requirement and several spacing distances within the busbar, such as clearance and creepage distances. Depending upon the busbar manufacturer and the busbar’s metallization and dielectric materials, the clearance and creepage distances will be a function of voltage capacity. Clearance is the shortest allowable distance in air between two conductors to prevent arcing, while clearance is the shortest distance along the surface of an insulator between two conductors to prevent arcing. Using a ROLINX busbar as an example, the minimum clearance distances for voltages of 750, 1,500 and 3,000 V are 5.5, 11.0 and 22.0 mm, respectively. The minimum creepage distances for the same type of busbar for 750, 1,500 and 3,000 V are slightly less, at 5.2, 10.6 and 21.6 mm, respectively. Such minimum distances must be taken into consideration in the design of any high-voltage busbars and its conductor and connector spacings. Otherwise, busbar manufacturers can review the minimum requirements for a busbar intended for use within an EV/HEV, or other power distribution application, detailing the tradeoffs between cost and material choices and performance. Of course, for EV/HEV power distribution applications, drive safety is an added concern and busbar materials selection should be performed with the intent of achieving the highest reliability possible, not only for meeting vehicle warranty requirements but for the safety of the driver and passengers. For more information, contact Rogers Corp. at www.rogerscorp.com.